My son, four years of age, has spent his lifetime in play mode. Exploring, discovering, learning by his interactions with the world around him, as it should be – and as it is naturally. In the past few weeks, I have noticed a tendency for him to “look” for something to do and I sensed it is time to have a few more “structured” learning activities on hand. I sensed the need for a game plan. This is when I stepped back and went to the Lord, asking for His game plan in guiding my child’s learning process. I wrestled a little with the public school structure that I had been immersed in for ten years, knowing I didn’t want to simply “recreate” public school at home. In all honesty, to move into the freedom of homeschool was a bit daunting. I wanted not the old way of things, but the perfect way of things for my son and for myself as the learning coordinator/facilitator. After conversing with the Lord about the in’s and out’s of where I had been before and where we were now, the Lord revealed the beginnings of His plan for us. This really started with the fact that I was collecting papers here and there that Mason had completed, displaying his learning path. It was accumulating and I realized I wanted/needed a more structured way of recording lessons and seeing where we had come from and where we were going. Ok, simple terms…I wanted a lesson plan book! The problem was that I knew it was going to need to be different than what I was used to using. It turns out it is not all that different of a lesson plan book, rather a different paradigm of schedule. 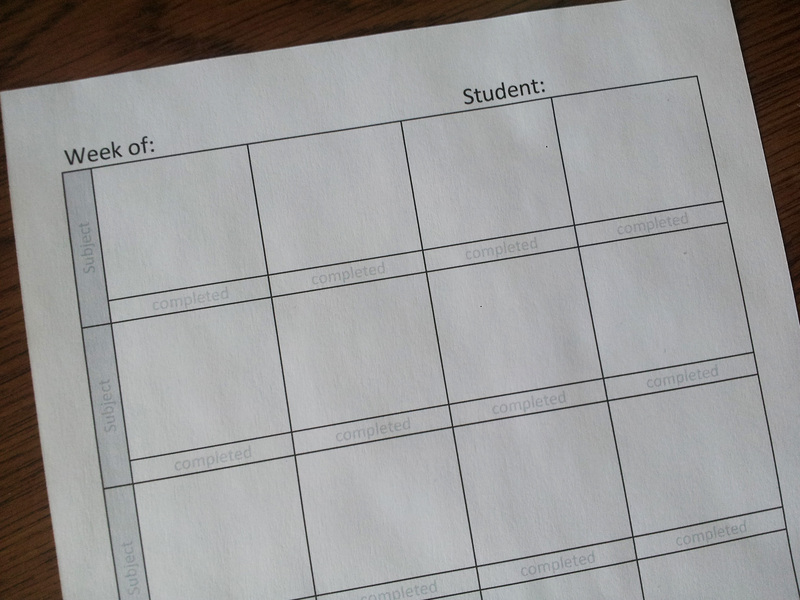 For each focus area, have 3-4 learning activities/lessons ready for the week. When an activity is completed, I record the completion date beneath the corresponding lesson. This will help us to not be rigid and yet also allow us to continue moving forward. I am excited about the freedom to do all math one day, or an activity from each area another day, or no activities in a day. I feel also, even at four, that it helps Mason begin to take the lead in his own learning and time management. Finding his flow, and our flow together each day. The template is simple and basic, yet exactly what we need at this moment in time. I am excited to use it and watch it evolve (maybe) in months and years to come. I plan on using the extra subject lines to write in our spontaneous moments of learning that turn into lessons in their own right. A basic outline, a simple structure that allows for life flow during the week – priceless. If you are looking for a simple tool to help you get started, or just for a place to start, then you are welcome to download this template for free and use accordingly.